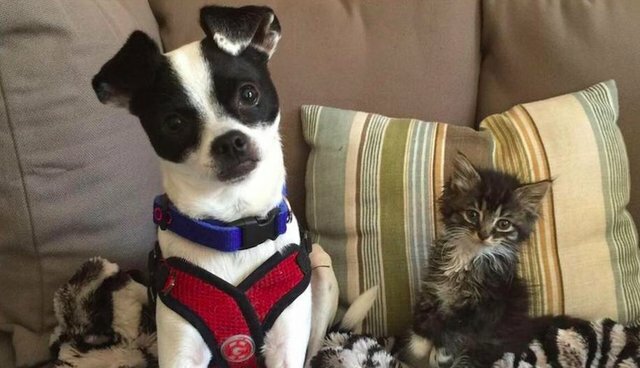 Skeeter the dog is something of a kitten fanatic. Luckily for him, there are a whole lot of foster kittens coming through his household. Unluckily for him, his affections are usually pretty one-sided. "He absolutely loves kittens. He protects them like they are his babies," his mom, Marnie Russ, tells The Dodo. 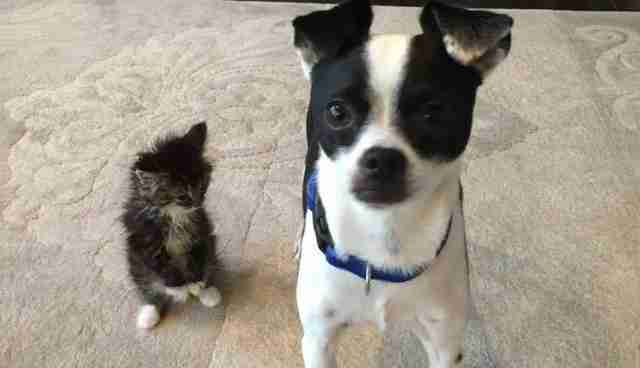 "Most kittens don't want much to do with Skeeter." Roo, however, is not most kittens. Russ is cofounder of the National Kitten Coalition. As such, she's taken in more foster kittens than a person could reasonably remember in the last 15 years. Hundreds per year, she estimates. Russ specializes in the hard cases - kittens who are extra tiny, or sick, or have some other issue that makes them especially delicate - which would make it especially hard for them to get out of the shelter alive. That's how Roo came along. 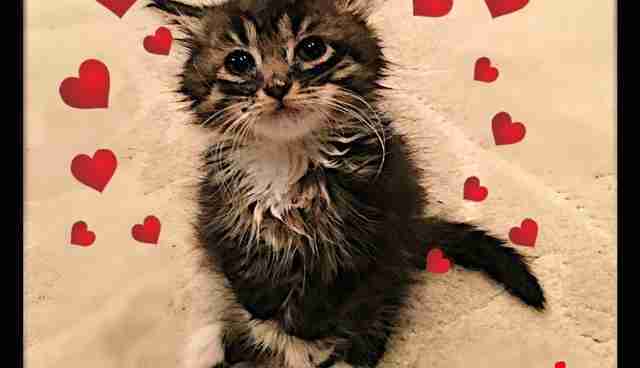 Last week, she and her two siblings landed in the Animal Welfare League of Arlington in Northern Virginia after they were discovered as strays by an animal control officer. Shelter staff noticed right away that Roo was underweight and walked a little oddly. When she sat up, her front legs seemed to just hang. 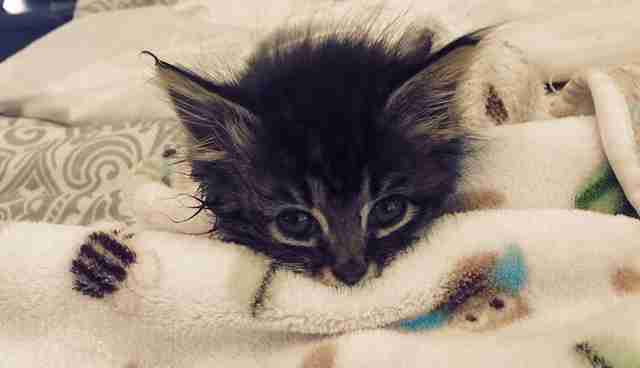 The kitten was dispatched to the NoVa Cat Clinic for x-rays, where her missing elbow joints were revealed. "We knew that Roo needed to be separated from her litter and get one-on-one care, and we knew just who to call," AWLA spokesperson Chelsea Lindsey tells The Dodo. Roo is settling in great. Russ is working on putting some weight on her, and getting her strength up. Her health overall seems good; the missing elbows shouldn't cause too many problems, once she's beefed up and gets physical therapy. And Roo is successfully working on wrapping Russaround her little paw. Russhas been unable to resist the little arms that don't bend, and the cute awkward walk, and the way Roo hops up into the lap of any person who is sitting nearby. Plus there's her impressively loud and forceful squeak. In under a week, Russ - who, recall, has resisted hundreds of others - declared her intention to adopt this kitten. "I fell in love with her the minute I picked her up at the shelter," Russ says. "I would never let her go." We know a few creatures who are going to be extremely happy about this turn. Russ herself, it goes without saying. Naturally, Roo, as well. 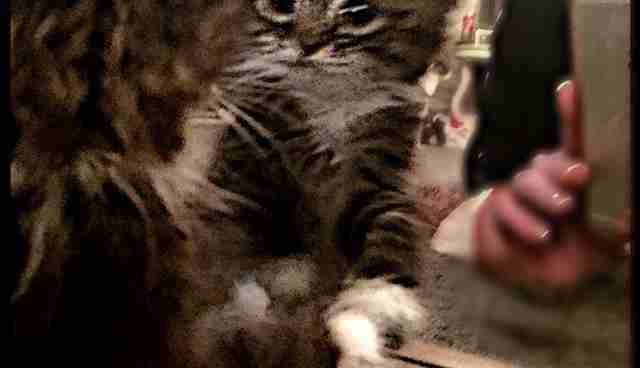 Plus all of Roo's fans, who can observe the kitten on her new Facebook page. And, of course, we cannot forget Skeeter the smitten, who has finally learned what it is to be loved. 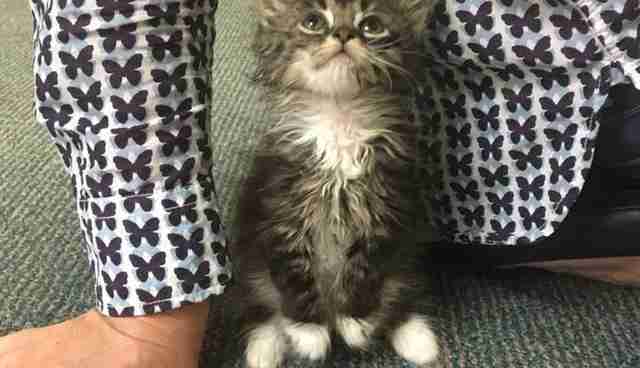 By this very special kitten who has no elbows, but the biggest heart. 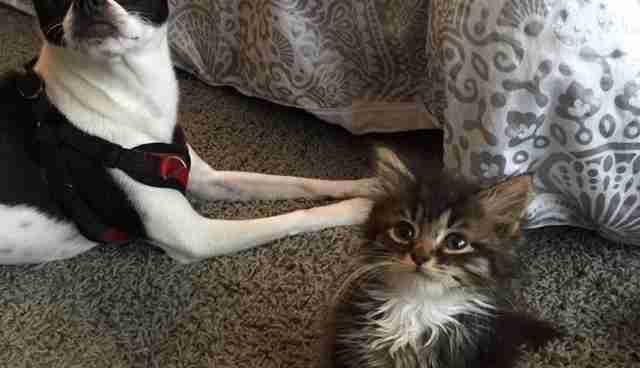 Yes, this canine - rebuked so many times before - finally has the kitten of his dreams. One who "reciprocates the love Skeeter offers," says Russ. "Roo follows him around like a shadow, and they are always together."